Sub: – Revision of Minimum Wages payable to Temporary status Casual Labourers – reg. Ref: Your office letter No. 49014/1/2017-Estt (C) dated 16th August 2017. Please refer to your office letter cited above copy of which is enclosed herewith for ready reference. It was informed that the matter of revision of wages payable to Temporary status Casual Labourers is under consideration. 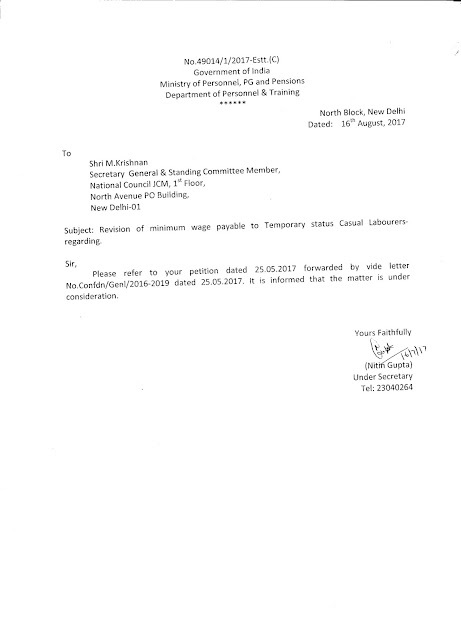 We regret to inform you that the orders of revising the wages of Temporary status Casual Labourers with effect from 01.01.2016 is yet to be issued, even though the orders revising the pay of Central Government employees was issued on 25.07.2016. It is once again requested to take necessary action in this regard, so that issuing of orders will be expedited.